Listen to your emails while driving to work - get on top of communication and formulate a plan for the day. Many people spend the first hour every day on email - you can easily cut this in half. During the day you can switch off your emails and concentrate on getting some work done, then catch up on emails on your drive home. You can de-clutter your inbox and make sure there are no surprises lurking there. It feels good to know you've not missed anything. How can I be more productive and less stressed? If you use Speaking Email when driving to and from work each day, this will reduce the number of times you need to check your email. Researchers have found that checking email less frequently reduces stress and improves our ability to get things done (see the research here). So not only does Speaking Email give you more time in the day, it makes the rest of your day more productive. What protection is there from malware and viruses? Try the "demo account", this give you the full features on sample emails. And try the free version, this gives you limited features but with your own email. When you have tried both those we think you will want to buy the premium version - but you can stay on free version as long as you like. Yes! The Basic Edition of our app is free. We made this so you can try Speaking Email, test it out connecting with your mail provider, a give it a go. It has fewer options, and plays little teaser promos where it should skip signatures. The Premium Edition is now available on a monthly or yearly plan for approx US$2 per month (depending on currency). This is incredibly cheap considering how much time Speaking Email gives you back. The Basic Edition is free. We made this so you can try Speaking Email, test it out connecting with your mail provider, a give it a go. It has fewer options, and plays little teaser promos where it should skip signatures. The Premium Edition is US$4.99 per month (or similar depending on currency). A fiver a month is incredibly good value considering how much time Speaking Email gives you back. How much time do you think you could save a month by using Speaking Email? A couple of hours at least, maybe even an hour a day. How much is your time worth? Or buy a year and get it even cheaper. We also have an Enterprise Edition which is ideal if you have a whole team and are innovating around improving productivity. Do you have voice recognition? Yes, Speaking Email can be operated using voice commands. Providing safety while driving and accessibility for blind and dyslexic users means we have to enable a variety of input methods and not rely on sight or touch. We've made Speaking Email support voice commands for daily usage, such as checking emails, replying and managing mail. You don't need to touch the screen at all, apart from setting up preferences. Speaking Email can wait for your command at the start and end of emails, and you can interrupt it any time if you touch the screen anywhere. You can say any of the labels on the buttons: "archive", "trash", "ignore", "flag", "repeat", "reply", "forward", "play". This makes it very easy to remember what you can say and when. You can dictate replies and even edit them (say "dictation help" when dictating to find out how). Anywhere you can say a command you can say "help" to find out what you can say, or "stop" to stop listening. Can it read email in French? Spanish? German? Yes the email reading and reply dictation work in all languages supported by your phone, so long as you have downloaded the relevant voices or speech recognition languages. 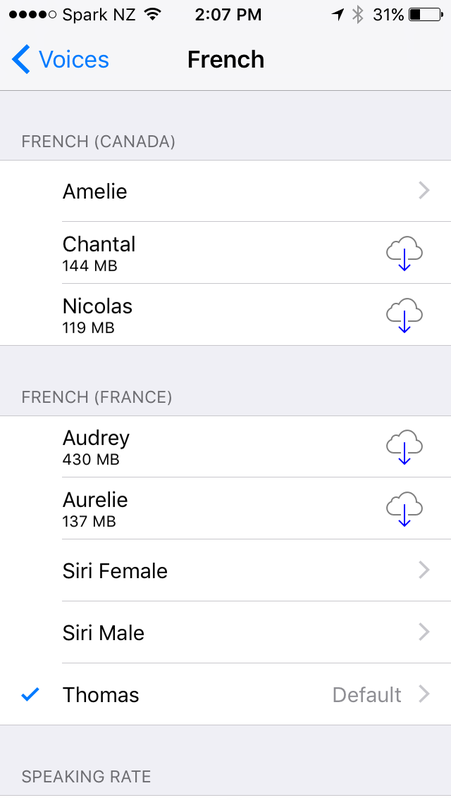 Speaking Email will switch voices to a French voice when an email arrives in French and then to Spanish when a Spanish one is detected and back to English when one comes in English. We call this feature "Multilingual" and it is a premium feature. The user interface and voice commands are always in English. So it is great if you are speak more than one language (so long as one is English). Our proprietary signature and disclaimer detection algorithms support French, Spanish and German as well as English. This means it will skip over signatures and disclaimers when recognised. How do you handle threads being read out? We treat conversation threads a bit differently, it's not like Gmail for example where you can expand and collapse the replies in the thread because we are preparing the content as speech. We automatically scan for your email address and stop reading out the email at the point that we know it already was sent to or from you. This way Speaking Email reads right to the point it needs to. If we simply cut off at the first reply we might miss something - for example if someone forwards you an email you don't just want to hear that person's words "see below - unbelievable". If we combined all replies from a thread together in one screen, we might be reading out old messages that you've seen before. If you don't have this feature switched on, it's under Preferences. PS. If you want Speaking Email to keep going beyond the thread cut off, you can just say "continue" to have it do so. Does Speaking Email support Gmail? Speaking Email works great with Gmail, including personal Gmail accounts, Gmail for Domains or G-Suite (Gmail for Business). All features are supported and we have some extra special features for Gmail, which include Gmail tabs and custom Gmail search query filtering. Gmail connections make use of Google security libraries, meaning your password is only ever sent directly to Google servers. Does speaking email work through (Bluetooth) the vehicle's hands free system? - or a bluetooth head set / headphone? Yes it does. It works with most Bluetooth equipment. Speaking Email works with Bluetooth speakers using Bluetooth Audio (A2DP) profile. It also works with a microphone and speaker using Bluetooth Hands-Free Profile (HFP), which is what cars use for making phone calls. Speaking Email switches between audio outputs automatically to get the best quality output. When enabling the microphone Speaking Email will automatically switch from A2DP to HFP, (and you will notice a drop in sound output quality). You should set up your phone to play audio to a bluetooth output such as your car stereo, or bluetooth headset / earphones. You might need to check your device documentation / car manual to see how to complete a bluetooth pairing. Once you have paired your phone with the car stereo or other bluetooth device, do a quick test - for example, play music or a youtube video on your phone, and make sure you can hear the sound through the car speakers. Check the volume slider and mute button. Once that happens, Speaking Email will just speak normally through your bluetooth paired connection. If you have problems, go into your phone's Bluetooth, remove the connection and re-pair it. That seems to solve 90% of issues. Force quitting Speaking Email, turning off the phone and Bluetooth speaker and starting again can also help. In regards to setup, firstly the App does not work if your device is connected as a Bluetooth Telephone device!! Next, you need to set your car’s Bluetooth connection to Aux or Other Bluetooth device depending what options are available in the vehicle. Next, go to settings, sounds and vibration, separate app sound and select both the App (Speaking Email) and audio device. Then reset the media sound volume under sounds & vibrations to the maximum as the sound level through the app is too low when using the Bluetooth option. If you have a long document to read through, just email it to yourself and listen when you like. Can I speak directly to Speaking Email? Yes! We offer voice commands and dictation of replies. When you 'tap' the screen during reading, the 'pause' screen appears and the phone starts listening for voice commands - they are simply the names of the buttons, so it is easy to know what you can say - like 'trash', 'next', 'archive', etc. You can also set Speaking Email to pause after each email, and wait for a command - this is so you dont even need to tap the screen. That is even more safe when driving. One of the coolest commands on the 'pause' menu is 'reply' - this allows you to dictate the entire response, check it is correct, and send it (or redo it, or cancel). On iPhone, the pause screen also appears when you press the 'action' button on a headset, or bluetooth device, meaning you can just hit the hardware button and then say a command. Is is accessible for blind or visually impaired users? If you are blind or visually impaired, you may find Speaking Email useful. The app reads out the contents of your inbox continuously (ie speaks each email in turn). It skips over email signatures, disclaimers and other email-specific clutter - making for a smooth and seamless reading experience. 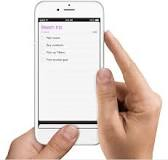 Speaking Email is fully accessible with VoiceOver, the screen reader that blind people use to interact with their iPhone. We’ve been reviewed as a fully accessible app on AppleVis, the online community for visually impaired iPhone users. 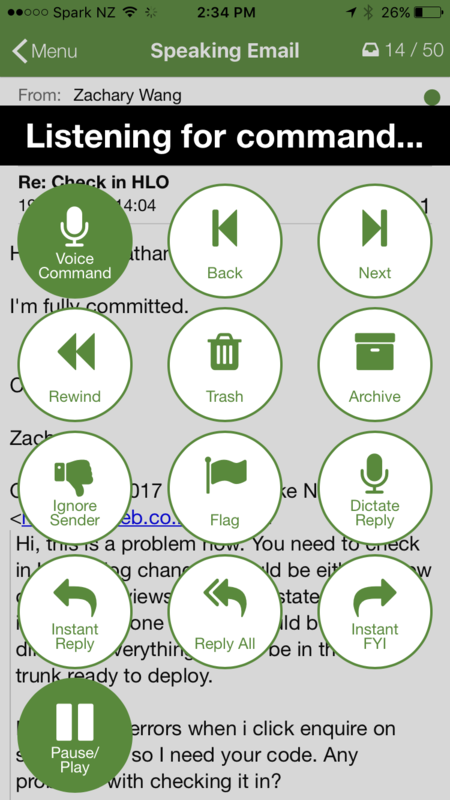 Blind users typically use VoiceOver (on iOS) to navigate and use apps. We've refined Speaking Email to be fully operable with VoiceOver. All screens and menus have accessible fields and prompts. When using VoiceOver on the mail reading screen you can swipe left and right to hear each email (just like you can without VoiceOver). You need to use the buttons in the button bar at the bottom of the screen in order to perform actions - archive, star, instant reply actions, instant FYI or ignore sender. Swipe up and down to go between the buttons and the tabset controlling the email slider. If you are not a VoiceOver user, you can double tap anywhere on the email to archive it. This shortcut is very powerful - you can easily clear email out of your inbox that you've already read. Archived emails go into an "archived" folder which is automatically created if you don't already have one (and many mail platforms have one by default). It is a not a replacement for an email client but rather an additional way of accessing your existing inbox in a more passive way - requiring fewer manipulations. Its focus is on reading our the content of the emails in your inbox. It isn't for composing or managing mail - for this you would still use your normal email app. I personally like having Speaking Email as an additional tool in my toolbox. I find it's nice to have the app automatically open any unread messages and having it start reading each message after it checks for new messages. I also like having the ability to skip over the information that I don't want to listen to such as the signatures. The option to automatically read the next message is a plus for me. This includes the option to skip the promotional messages. I think this app is worth it in my book. Can it be used for stroke victims? If you have a stroke it may render you unable to read. This app can help you by enabling you to keep in touch with people via email, and not feel out of the loop due to your inability to read text. "one of my current clients is a woman who has had a recent severe stroke. She went from being only able to repeat words to speaking in sentences with difficulty. Due to the stroke she is unable to read, which had been a social avenue for her. Today I found your app and I put it on her phone. When we used it for the first time she cried. She is now able to listen to all the emails she has received since she had her stroke. Your app has decreased her isolation and drastically improved her quality is life." Wouldn't this be good for people with dyslexia? We have had feedback from users with dyslexia that Speaking Email helps them tremendously. It is a positive force, enabling them to receive emails and listen instead of having to read. How do I tap in the email whilst driving without being dangerous? You need to get a phone holder. These are quite cheap and you can get them anywhere. This is definitely recommended. Actually there is another option, which is wait for the “listening” pause and then say your command. This way you don’t have to touch the screen at all, as it will pause for voice commands several times a minute. The maximum it will go for without pausing is 30 seconds. I would still recommend a phone holder as it’s nice to have the option to tap when you want. If you don’t have this listening trigger switched on, you can set up under preferences > voice commands. Switch on all the trigger pause options. Does this app enable safe driving? If you compare this app to using a normal email app, there is no question that Speaking Email is much safer. If you are sneakily checking your email in the car, this app provides a much safer alternative. In terms of driver distraction, anything can be a distraction including talking to passengers, hands free phone calls, kids, music. Listening to your emails is mostly passive, and Speaking Email requires minimal to zero interaction. All interactions are optional, and none take your eyes off the road for more than a second. So we think on the continuum of driver distraction, this app is much safer than texting and driving, and probably safer than making a phone call with your phone in a cradle or hands free. It requires minimal interaction, having only one main screen, meaning there is no need to navigate between screens. There is no way to type replies and no need to ever use the keyboard. Your emails can be continuously spoken, meaning you never need to look at or touch the phone. If you wish to skip an email, go back, or archive an email, you can easily tap or swipe anywhere on the screen without looking. You only need to glance at the screen and tap once if starring (flagging) or twice if sending an instant reply (from pre-set text options that you can set up yourself). You can also optionally glance at the phone any time to see your email with images and layout, to get a quick feel for it. But this is purely optional. Your phone should be in a fixed mounting if you intend to touch it, and depending on your local regulations this may be a requirement. Studies show driver distraction is worse talking on the phone than listening. Some studies even suggest that talking with passengers is more of a risk than listening to voice recordings, because preparing to speak has a higher cognitive load than passive listening. How about US laws on mobile phones and driving? Mobile phone driving laws vary by state, and a good summary map is available here. You must only use your phone handsfree if you live in California, Connecticut, Delaware, Washington DC, Hawaii, Illinois, Maryland, Nevada, New Hampshire, New Jersey, New York, Oregon, Vermont, Washington, or West Virginia. That means you can use Speaking Email to read your inbox out to you but not archive, star or reply. You can listen to your emails, which will be read out in order of your inbox with unread first, but not swipe or tap the screen. 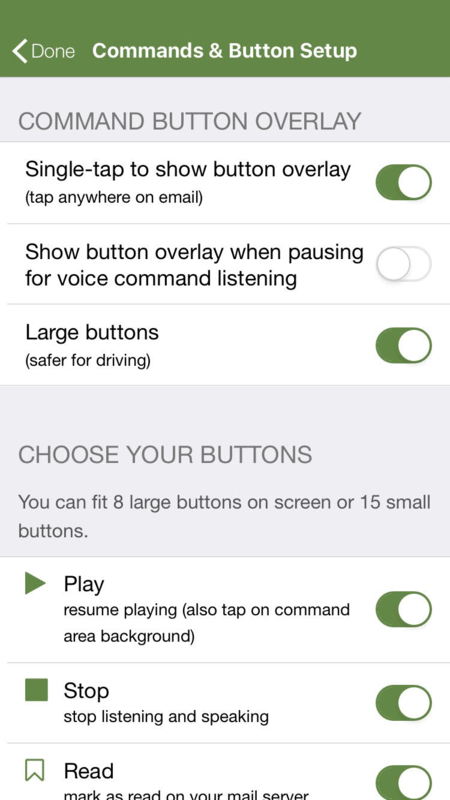 There are a couple of settings and preferences you may like to switch on if for best handsfree usage. We believe it will be OK to use all features of Speaking Email in these states, provided it is not causing a distraction. Speaking Email does not allow you to type or require any complex interactions - its nothing like texting and driving, which is banned in many states. How about UK laws on mobile phones and driving? In the UK you must use your phone hands-free only. That means you can use Speaking Email to read your inbox out to you but not archive, star or reply. You can listen to your emails, which will be read out in order of your inbox with unread first, but not swipe or tap the screen. There are a couple of settings and preferences you may like to switch on. For the official word see the gov.uk site for laws and regulations in the UK on mobile phone usage while driving (or see think campaign for advice on mobile phone road safety, driver distraction, texting and driving). How does it fit with mobile phone driving laws in Australia? In Australia mobile phones must either be operated entirely hands-free or placed in a commercially-manufactured cradle if you want to place a call, or use the phone as a navigation or other aid. An email reader is not really an aid so we recommend Speaking Email be used in a hands-free manner in Australia. See more info on the Australian road rules regarding mobile phones. We've been featured in the the Australian, Daily Telegraph, NT News, SBS, Sky News. Can I get driving directions and traffic news and read my email too? When driving you can switch between different apps to get all the services you want. Siri or Google Now can help directly with driving directions and live traffic updates, and you can ask them to open Speaking Email to help with the last. Instead of "read my email" just say "open speaking email". You can easily switch between apps using voice commands, and other apps can interrupt your email listening as needed for driving directions, local maps, traffic news and the like. Speaking Email is a dedicated voice app for reading emails out loud while driving. You can use Google Maps to get driving directions, announcing turn by turn instructions, while Speaking Email is reading your emails out. You can get traffic conditions on iPhone by asking Siri "what's the traffic like" or "traffic report" or on Android by asking Google Now. To switch apps on iPhone, use Siri and say "open speaking email" or "open google maps". Google Now provides this same functionality on Android. You will find Speaking Email is the best email app for reading your email while driving. How does Speaking Email fit with various laws and regulations? Many countries and states allow use of a mobile phone so long as it is in a cradle, does not require too much button pressing, has no typing needed and requires only glances at the screen. For example in New Zealand the phone must be secured in a mounting fixed to the vehicle and the driver must manipulate or look at the phone only infrequently and briefly. Drivers are specifically banned from reading and composing text messages and emails. Our app enables the driver to glance at and listen to emails, which we believe is acceptable. Our reply function is a predefined list and doesn't allow you to type a message. Every function is a swipe or at most two taps, so this is minimal manipulation. We've taken care to ensure there are no complex gestures, small hit areas, keyboard input or demanding processes. You obviously need to use this app only as permitted in your area (if using while driving). We do not (and couldn't) provide any guarantee about whether your use of this app while driving would be considered unlawful in any jurisdiction. Where can I find out my email server settings? Most email providers have their settings available on their website, so google is your friend. For example search for "vodafone email settings"
Or look in your phone mail settings. You need to get your email settings, which you can find in your Settings in your phone or on your computer (eg in Outlook). First thing is what kind of email server is it? If you are unsure which server type you have, choose the "Other" option. Try typing in your email and password and see if it works - we can automatically detect many common email providers. If not you will need your IMAP server name. Note that some features are not supported on some email platforms. Exchange does not support replies. POP does not sync archived and flagged emails back to the server. How do I set up an Xtra account? 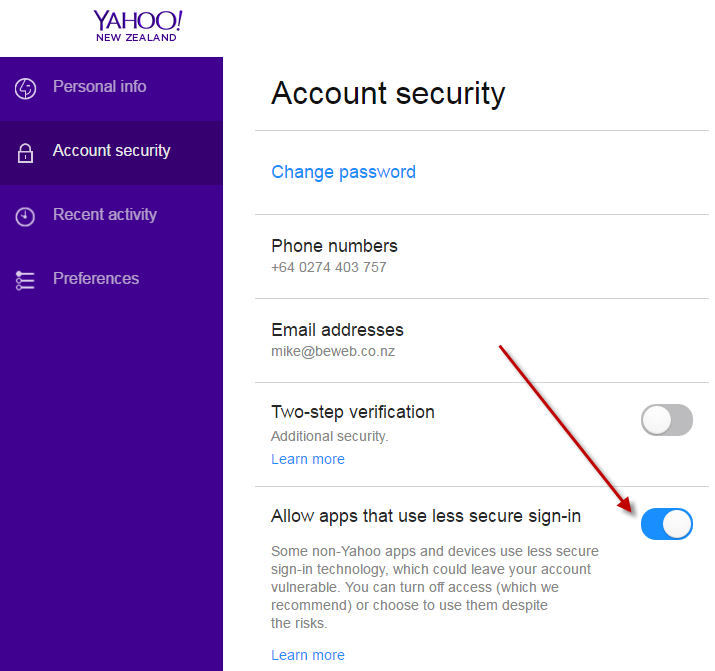 If you are setting up Speaking Email with Xtra (New Zealand email addresses), you need to use the Yahoo account set up. In Speaking Email, click on Account Settings, and then click 'Add Yahoo Mail' account. What can I do if my account is disabled in for ActiveSync? If Speaking Email says your account is disabled for ActiveSync, you will need to see your Exchange system administrator. If you are managing the mail server, you will need to look for the setting to enable ActiveSync either on an individual account or a wider group. The screenshot below shows where this setting is in Office 365. 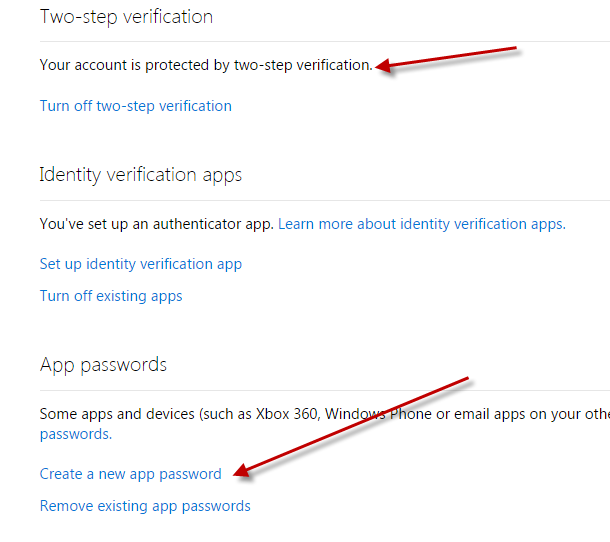 If you have multi factor authentication (MFA) turned on, you will need to use a one time "app password" for Speaking Email - see these instructions from Microsoft. Can I connect to AOL? If your account is protected by AOL 2 Step Verification, see the below information to set up an "application-specific password" for Speaking Email. This is the most secure way to connect apps to your AOL account. I use the email app that came with my Samsung - how can I see what server type it uses? Here's how to find out what your email server is using the email app that comes with your Samsung. 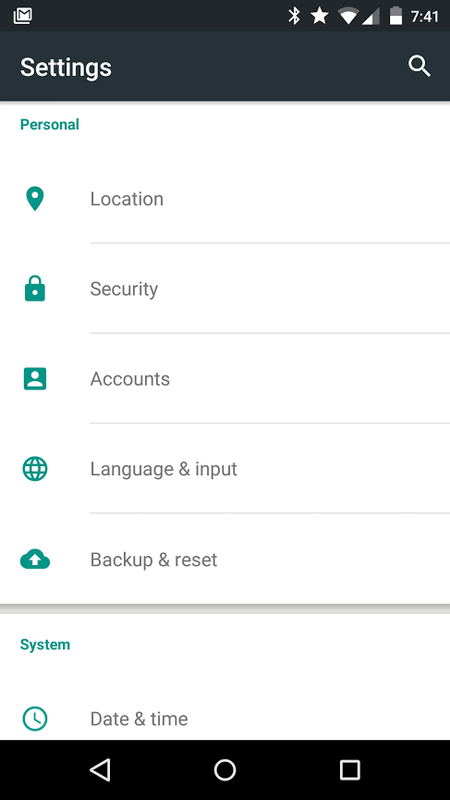 - In the Android email app, open the menu and hit "Manage Accounts"
- Scroll to bottom and hit "More Settings"
- Scroll down to the bottom and under "Server settings" it should say the server type, for example "Exchange server settings"
Can I use a non Gmail account? This means we support 99% of the email user base. If you have Lotus Notes, we don't support this natively, but you can use your email via IMAP if your IT team has switched on the IMAP protocol. Email us: feedback@speaking.email if you have any issues connecting to your mail server. Can I check my Lotus Notes email? Speaking Email does not support IBM Lotus Notes directly. But if your server administrator has set up the "IMAP service" option then it will work (use "add IMAP/other account"). Does it work with Exchange or Outlook? Yes! If you use Outlook in an enterprise environment you are probably using Exchange server (don't be confused with "Outlook.com" - that is Microsoft's new name for Hotmail and is not the same at all). We use ActiveSync to connect to Exchange server, which is the same protocol as your iPhone or Android mail uses. If you connect to your mail on your phone already, check your phone mail settings, which will show if you are connecting to Exchange. It will also show your server name and username. Your server name should be just the host and domain name (eg mobile.myserver.com). If it passes the checks and you can't connect to Speaking Email, copy the detailed report and send it to us at feedback@speaking.email (it doesn't contain any private details). Do you support Office 356 Exchange Online accounts? Yes we do! Office 365 is fully supported. We provide secure login directly to Microsoft or your own organisation sign-in page, including MFA (multi-factor authentication), for example via text message or authenticator app. Speaking Email uses ActiveSync to connect to Exchange Server. It appears with the User Agent name “Speaking Email SE” so you can clearly identify clients. Speaking Email supports most ActiveSync features, including autodiscover, provisioning and remote wipe. It supports Basic Authentication and Modern Authentication. Exchange Online MDM (mobile device management) is supported. You can disable individual clients and an appropriate error message will display in Speaking Email. What does it mean, email address not a valid mailbox? This means the email address you entered is probably not correct. You most likely mistyped it. Otherwise your email account or mailbox may have been suspended by your provider. Speaking Email attempts to connect to your mail server using IMAP protocol. If an error is returned we then check whether your email address appears to be valid by using an email validation system (SMTP lookup and deliverability test). Only if our test reports that this email address is not a valid mailbox then we show this error. What does 'Gmail error 400: Mail service not enabled' mean? This means the Gmail API that Speaking Email uses to communicate with Gmail is not able to be used for your account. Most likely your email address is not a Gmail account. It is possible to be a Google Account but not a Gmail account (for example if you use the account for YouTube but have never enabled Gmail). Otherwise, if you have G Suite (aka Google Apps for Work) your organisation administrator may need to enable the Gmail feature or Gmail API access. 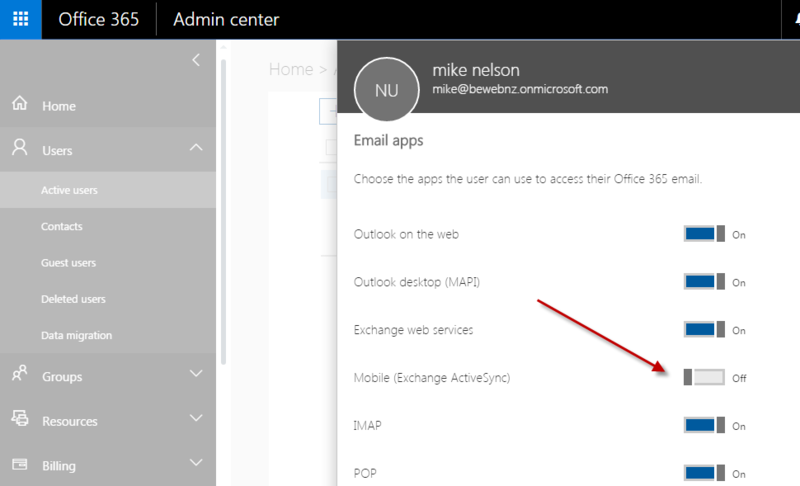 How to enable Microsoft Intune access to corporate mail? Speaking Email has special features to enable support for Microsoft Intune (Enterprise Mobility + Security). 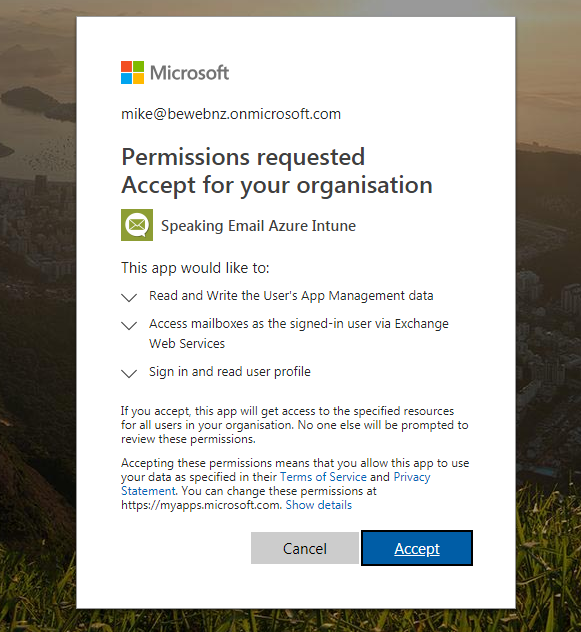 Depending on your Conditional Access (CA) policies you may need to have Azure tenant admins provide permission to access corporate email. In this case a Microsoft screen will appear saying "Need admin approval". 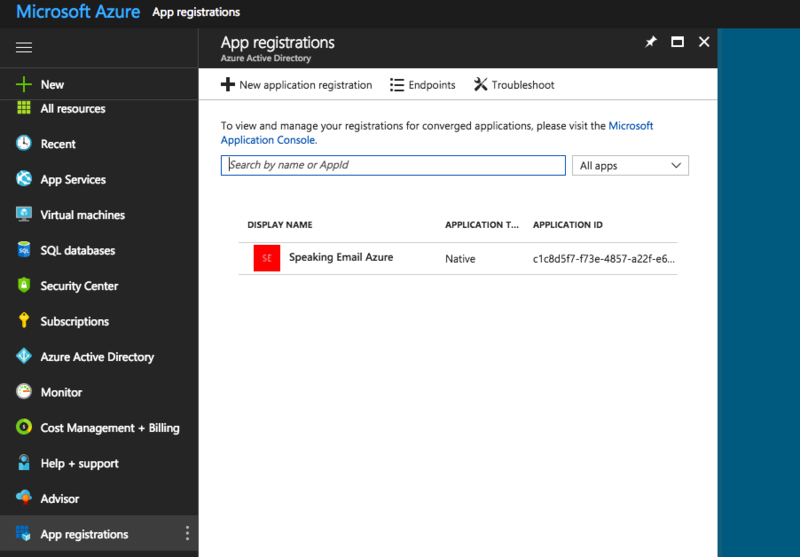 To do this, your Azure admin can either add the app in your Company Portal, or grant permission via consent links. Click here to grant required permissions to Speaking Email. You should be directed to sign in to the Azure portal under the correct user account and then see a prompt similar to the following. For more information about consenting app permissions, see this Microsoft article. 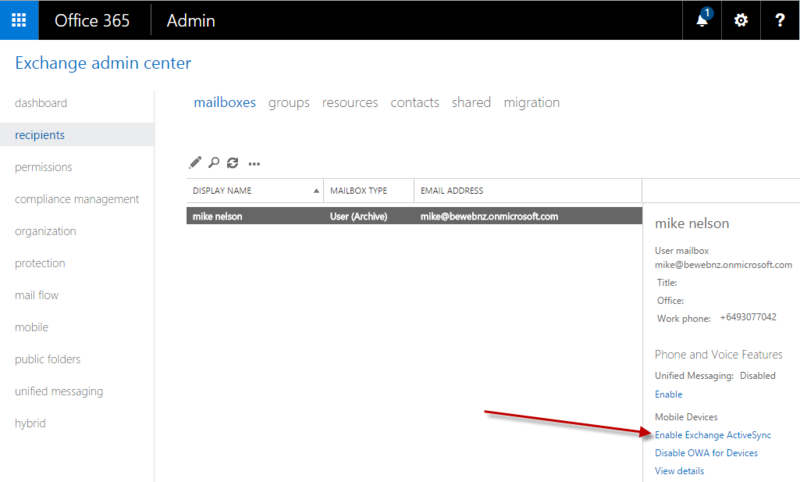 Speaking Email will appear in the Azure portal, allowing you to see what permissions it is using. If you mail is not coming through, you can check to make sure these permissions are available. If your Office 365 is under default settings, you shouldn't need to worry about this. In some cases you will need to manually check and grant this permission. The screenshots below show you where to do this. Why can't I connect to my Exchange or Office 365? Speaking Email uses the ActiveSync protocol to communicate with Microsoft Exchange server, Office 365, and Amazon WorkMail. It's the protocol used by all Android and iPhone built-in mail apps, and it is designed for optimal mobile data usage. This is a fairly complex protocol and supports a range of server versions, security policies, and administration features. Due to the wide range of different configurations, some issues may be encountered. If you are using Office 365, we recommend setting up an "app password" for Speaking Email - see these instructions from Microsoft. If this option is available to you, it is more secure and works in a wider range of configurations. Could not connect to Exchange server using ActiveSync using the supplied credentials. When you enter your credentials to connect your account, Speaking Email validates and provides appropriate error messages to help you fix what is wrong. When a server is not reachable, we check to see if its IP address can be located using the internet domain name system (DNS). The server name could not be resolved, let alone reached, so is probably incorrectly typed. This server name could not be found on the internet, which means it is either not existing or is only available from an internal network. Check your password and make sure it has not expired. Note that passwords automatically expire (depending on Exchange server policy). You have entered a username which is not a valid email address, so this will not be your correct username since all usernames in Office 365 are email addresses. We probe your Exchange server to see if it responds to an OPTIONS command. If it returns HTTP 505 or 501 then this message is displayed. This could be a configuration error on your Exchange server (check ActiveSync is working from other devices). Or it may be that your server is not Exchange or Amazon WorkMail or is very old. Domain - does your account need this? Username - should it be your email address or just a username? Server - is this the correct server where your account resides? If you have multi factor authentication (MFA) or Modern Authenticaton turned on, you will need to use a one time "app password" for Speaking Email - see these instructions from Microsoft. This is not an Exchange / Office 365 account. When the Exchange server rejects your credentials we do a check of your email address to see if we can automatically determine what account type it is, so we can suggest what kind of account it is you need. Please add the account using the correct account type in Speaking Email. Check your email address for typos, or you may have a different account type. Verify that you can connect using ActiveSync in another email client, or use the Microsoft Remote Connectivity Analyzer. Your system admin can check on whether your server is rejecting Speaking Email based on its User Agent string. Server may not support Exchange ActiveSync - cannot connect to [endpoint] (AS3). This may not be the correct server name. Check that the endpoint address looks correct. You may have typed it incorrectly. This error indicates that the server is not an ActiveSync server, so check if your mail server does actually support ActiveSync and whether it has a different address. If unsure what to do, you should verify that you can connect using ActiveSync in another email client (eg iPhone or Android mail), or use the Microsoft Remote Connectivity Analyzer. Some enterprises use an MDM system, such as Microsoft Intune, to manage employee access to apps via a "corporate app store". If your enterprise uses an MDM system and your connection is not working, first try using a "app password" if you are able to use this. Otherwise, please contact us on feedback@speaking.email to ask if we can support your system. Why I am getting ActiveSync error messages? If you have multi factor authentication (MFA) turned on, you can use a one time "app password" for Speaking Email - see these instructions from Microsoft. If you are on Office 365 and have Modern Authentication or other extra security measures (including MFA) you can enable Modern Auth in Speaking Email - account setup > your account > switch on Modern Authentication (OAuth). By default Exchange Server 2010 only allows you to use 10 email clients at a time. To use Speaking Email you need to delete any partnerships with devices or mail clients that you are no longer. More recent versions have a limit of 100 partnerships, but you could still encounter this limit if you add and remove accounts a lot. For more information on how to resolve this, see this article from Apple. When a new device is activated for the first time, it may be blocked or quarantined by default or according to policies set up by the sysadmin. You may be sent an email about it, you may just need to wait, or you may need to contact your sysadmin to get Speaking Email unblocked. There are many ways to block access according to Allow/Block/Quarantine (ABQ) rules. Here is a guide to this topic from Microsoft. This means a "remote wipe" has been requested by the server. This would normally happen when someone loses their phone or an employee leaves. In this case we remove all email and personal details from the phone. You can specify the number of days back to sync under Account Settings. But if this results in more than 20 pages of headers (or 2000) messages, Speaking Email will automatically reduce reduce its time window for latest messages. We do this in order to operate efficiently and avoid throttling limits. We also automatically extend the number of days back when there are too few messages. This might be due to network interference, so try again, or some network configuration (eg a proxy server or firewall). Cannot connect to Exchange. Perhaps your password is incorrect or you are offline. Go to Account Settings to reconnect. This is a generic error that occurs when Speaking Email tries to connect to Exchange and fails. This can actually indicate that the server rejects your credentials or that it cannot be reached. Check that you are connected to the internet, and whether your password has expired. Talk to your system admin to check if your email account is enabled and has ActiveSync enabled. Otherwise ActiveSync could be incorrectly configured or disabled. Try accessing your account from another mail client, eg iPhone or Android mail. ActiveSync: Perhaps your password has changed. Access is denied due to invalid credentials. Code: 401 Unauthorized. Go to Account Settings to reconnect. By default Exchange Server requires users to change their passwords on a regular basis. Your password may have expired since you last used Speaking Email. Just go to Account Settings > Exchange Server Settings, type in your new password, and click Connect Account. By default Exchange server restricts connections in a variety of ways. We try to avoid hitting the default limits by slowing down requests and performing batched actions, but it depends on the server version, configuration, throttling policies and what other devices are connecting. Office 365 is particularly restrictive, so you may hit this error more often that you would like. If you are typing the correct password, it is likely you need to use an "App Specific Passsword". This will be the case if you have 2-factor authentication or 2-step authentication turned on. 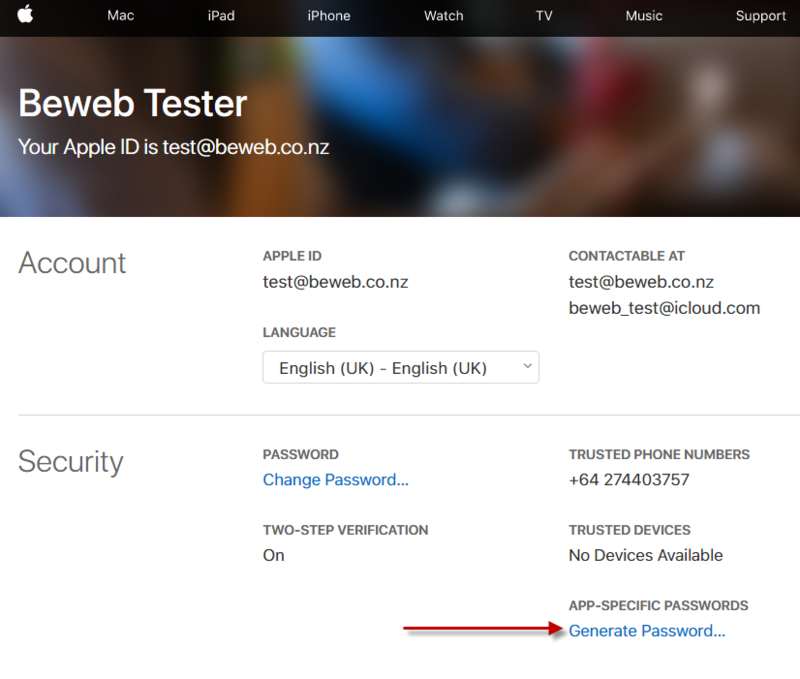 App-specific passwords are a security measure designed to keep your Apple password safe so are a very secure way to connect to Speaking Email (full details here from Apple). It is easy to create an app-specific password. 3. Follow the instructions and type the generated password in the password field in Speaking Email. Another possibility is your account may have been locked for security reasons by Apple. This is easy to unlock, just go to iCloud online and try to sign in there. 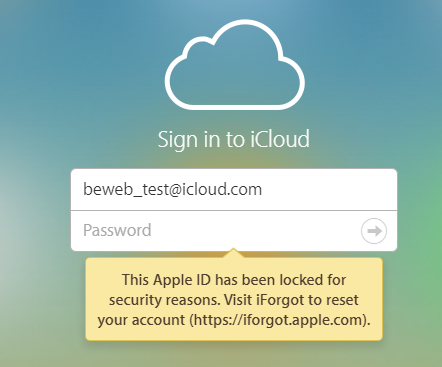 If your account is locked you will be forwarded to iForgot and given instructions. How do I set up with Telstra/BigPond? Full details are on Telstra's website here. If your Yahoo password is not working, it may be due to increased security requirements Yahoo has placed on apps connecting. We suggest you set up an "app password" which makes this connection very secure. See the instructions from Yahoo here for creating an app password which you can use instead of your normal password when asked for a password in Speaking Email. This is the most secure method of connecting. Click here to go to the Yahoo security settings page where you can set this up. Alternatively you can enable apps to connect via IMAP by changing a setting in your Yahoo account (shown below). Speaking Email uses IMAP to connect to Yahoo, which is the industry standard. IMAP has a secure mode, which Speaking Email uses, meaning all data including your password is encrypted over the network. Can I add multiple Gmail accounts? You can add any number of any type of accounts. When you click add Gmail account the second time, your first account is preloaded in the "google" connection screen. To change this, click your email address in the top right corner next to the Google logo. Why is my Hotmail or Outlook.com password not working? If you have entered your email and password correctly but it says it is wrong, it could be additional security from Microsoft kicking in. You can set up couple of different ways to secure your Outlook.com account, and you may have one of these set up (possibly without realising). Check your email to see if your account has detected you trying to sign in and rejected it. There should be instructions on how to allow a new app to access your email. Sometimes just signing into your account can "unblock" it and you don't need to do this next step at all. If your account has two-step verification enabled, you will need to sign in to Outlook.com on your web browser, and click on 'App passwords' to generate a one-off password. This password can then be used for Speaking Email, keeping your normal password secure. I'm having trouble, how can I send you a screenshot? Send us the screen shot, along with the time, date you took it, and which time zone you are in. How can I solve 'Error reading your mailbox with IMAP'? Speaking Email supports an IMAP account type, and also uses secure IMAP to access most cloud providers (Outlook.com/Hotmail, Yahoo, AOL, iCloud). This error is shown when your login to the IMAP server was successful but an error was returned when we try to read the contents of the mailbox. This is an unusual situation and may indicate a problem with your mailbox. Your mailbox may be busy or be restricting access due to too much activity. Wait a while and try again. Duplicate folders - if you try to access Exchange server via IMAP it will not allow any duplicate folders. These are allowed in Outlook and OWA (Outlook Web Access) so you can use these to find and delete any duplicate folders. No such mailbox, can't access mailbox, or cannot find Inbox. Try accessing your mailbox using IMAP from another mail client or use Microsoft's Connection Tester. 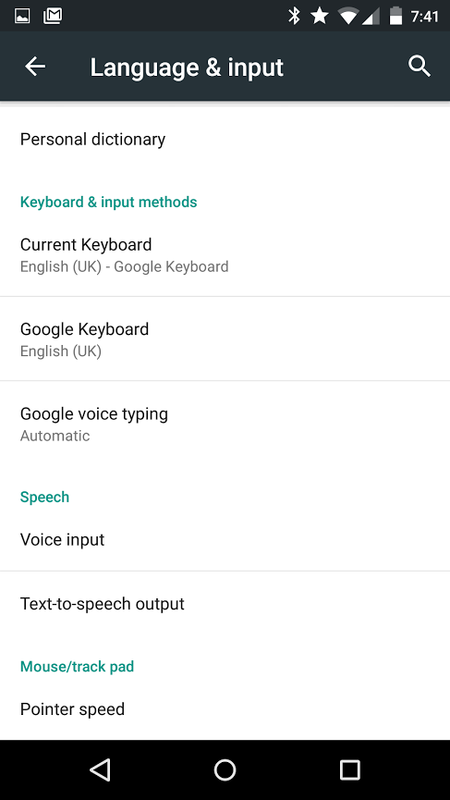 How do I get speech and voice recognition working on Android? You may need to tweak your system settings for an optimal experience. 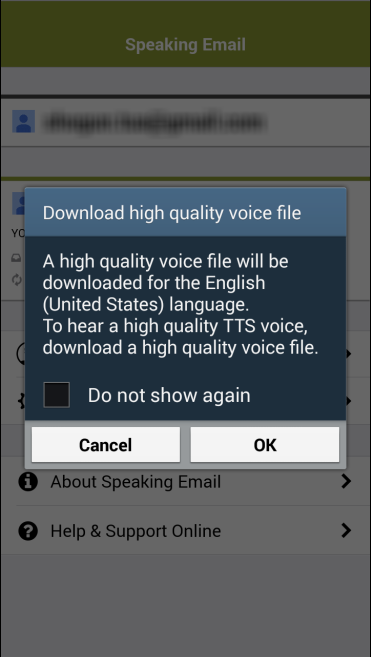 Here are some tips for setting up Android for speech and voice recognition. Speaking Email uses "Google Voice Typing" for dictation and commands. It works offline so you need to download the offline voice. When you have done this, you need to make sure the same language (eg en-US, en-GB, fr-FR, pt-BR) is used in various settings so that everything works. Look under 'Language & Input'. Tap 'Offline Speech Recognition', and install / download all languages that you would like to use. Note: if your preferred language does not have an offline voice available under Google Voice Typing, you must choose a language that does and make it your default language. 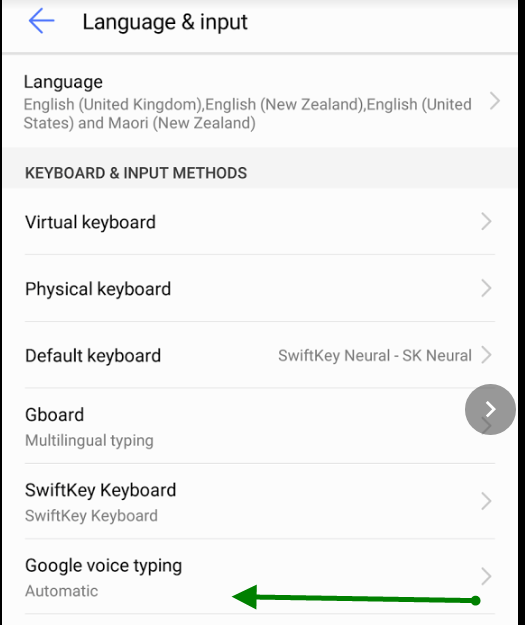 Go back to 'Google Voice Typing', and select the languages you want to use under 'Languages'. You may have some system setting inadvertently disabled. The best way to check is to open Google Voice Assistant. If something is disabled it will detect and prompt you guide you how to turn it on. Look under Accessibility > Text-to-speech output. 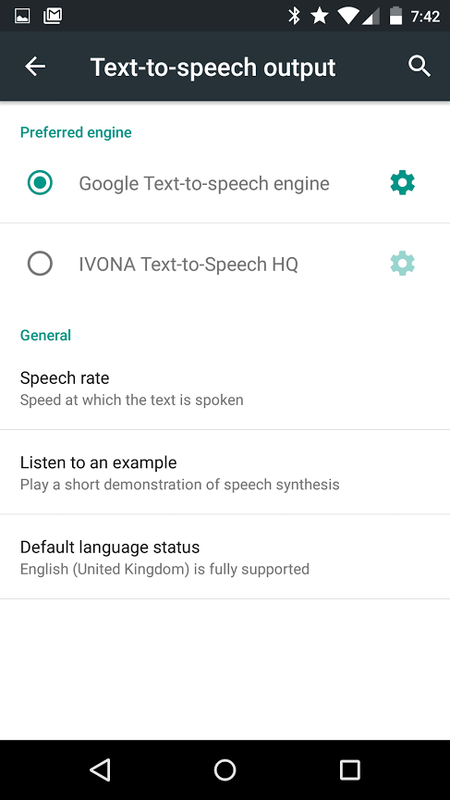 Ensure you have "Google Text to Speech" selected and the correct language. Note that Speaking Email won't use Samsung or other vendor voices - so you need to enable the Google voices as your default TTS engine. Tap the cog next to Google TTS Engine. Download the voices in any languages you need. I have archived an email by mistake - how can I get it back? 1. If you realise just after you archive it, swipe back, tap again and you will see the "archive" button highlighted. Just tap it again to undo. 2. If it's a bit later, go into your regular mail program, for example Gmail, Outlook, or your webmail. The location of your archived mail is different for gmail that other mail servers. Go to Gmail in your browser and go into the folder called "all mail" and you will see everything including archived emails. Or you can search in gmail. Archived email will be moved to a folder called "archive". This will either be a built in folder that already exists or Speaking Email will create it as a personal folder. Why do I have to touch the screen before a voice command? Voice recognition requires a trigger - it can't be listening all the time due to battery, bandwidth and time limits by both Apple and Google voice recognition engines. We've added a new feature that waits for 10 sec at start or end of email for a voice command - see under preferences. Can I delete a word while dictating? Punctuation? Other commands? Sometimes when dictating Speaking Email inserts the wrong word. You can now say “delete word” for these situations. Here's a list of voice commands you can use while dictating. Say “Dictation done” to hear the text read back to you. Speaking Email then prompts you to say “send”, “redo”, “cancel” or “more”. If you want to do more editing or add text say “more” and you will return to dictating mode. Speaking Email adds automatic capital letters and a full stop at the end. Speaking Email uses the default system voice. In the premium edition, you can also select a voice. If you download new voices under system settings you can then select them in Speaking Email. In Settings go to General > Accessibility > Speech > Voices. Tap "Voice". If you don't see a "Voice" button, turn on one of the accessibility options eg "Speak Selection". Choose English (or your phone language). You will see a number of regional voice options. Speaking Email will pick up your region from regional settings. If your region's voice is set to "Default" it may have that Siri-with-a-cold effect. If it is, try setting it to any of the "Enhanced Quality" options. For the voice to take effect restart Speaking Email. You can now select which voice to use in Speaking Email Premium Edition, under Preferences. Can I compose new emails? You can compose a reply to an email you have received but unfortuanately we don't support composing a new email. The reason is that we don't have access to the phone's address book name recognition. We can request permission to the phone address book but unfortunately cannot do voice recognition against it. Our voice recognition is only common first names and real words, but some people have unusual names and this is a very different challenge. So if you hold down home button (or other trigger for Siri) then say "compose email". If you have voiceover on Siri reads the options to you (very helpful, normally it doesn't bother). Then tell Siri "open speaking email" to get back. What is high quality voice download? You may be confronted with this dialog on some Android devices. Can I change the voice that the phone speaks with? Yes, you can choose your preferred voices to read with, when you upgrade to Premium. You can choose any installed voice to be your email reader, and a second voice to be your "announcer". If you understand more than one language, turn on the "multilingual" switch to have your email run through language detection and spoken in the correct voice for the language. In the Basic edition, Speaking Email will automatically select an appropriate voice based on the language selected in your system preferences. We use built-in system voices, so your phone is processing all text-to-speech locally, and your system preferences are obeyed. In iOS, you can download Apple voices in system settings. In iPhone Settings, select General > Accessibility > Speech > Voices. You will notice that I have the defaul option, and another 3rd party option. In this case I used IVONA - a free speech engine you can get on the app store. Now tap the cog next to the TTS engine, then tap “install voice data” to download a high quality voice. Why can't I select Siri voice? Apple does not allow 3rd party apps to use the Siri voices. 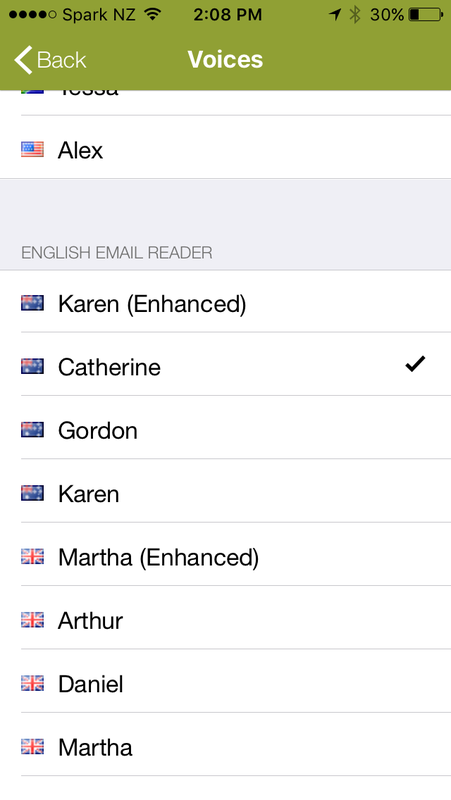 Speaking Email will however use any 'Enhanced' voices that you have available on your phone. You can check and download extra 'Enhanced' voices under System Settings > General > Accessibility > Voices. To select a voice to use in Speaking Email, go into Preferences > Voices and choose the voice you like for each language. Note there are two 'English' selections - one for the 'announcer' and one for English email reading. How do you delete old mail? There are a couple of options depending what you want to do. Generally Speaking Email is designed to work seamlessly with your mail server account. Therefore if you delete emails in your regular mail client, or in Speaking Email, they will delete in both places. To delete old mail from Speaking Email and your mailbox on your mail server account, tap Trash. You can say “trash” or “delete“ when Speaking Email is listening for voice commands (the buttons are on screen and the voice command button is green). Or you can tap Archive (moves into a folder "archive" on your mail server). To delete it from Speaking Email only, and not your mail server, go into Account Settings, and change the "Archive" command to not do anything (set the switches to off). Then use "Archive" command to remove them in speaking email without affecting your mail server. There is a shortcut double-tap to archive. I had an error, how do I take a screen shot on my phone and send you the error? We would like to make sure the app works for all users, so if you get an error, we would like you to provide some details about the issues you had, hopefully with error messages or screenshots. Screen shots are great for helping us understand the problems you might be having. On an Android phone, such as a Samsung Galaxy, you can take a screen shot by pressing the power key and the volume down key at the same time - for approx 3 seconds. This will put the photo of the screen in your camera gallery, where you could email it to us on feedback@speaking.email. For iPhones, you simply need to press the power button and volume up (or home button for some versions of iPhone) at the same time. Again, this will put the photo of the screen in your camera gallery, where you could email it to us on feedback@speaking.email. Is there a way to have the app mark Promotional Emails as read as it goes through them? Even though there is a 'skip promotions' feature, I find it best not to use “skip promotions” and instead double tap when they appear so they are cleaned out of my inbox. I also use “ignore sender”, but again that doesn’t mark as done. Other people might not be after an inbox clean but more an email scan so it would be useful for their case. If you do switch on "mark as read when speaking" (under Account Settings), it will 'mark as read' every email as it goes past including promotional emails that it skips. See also "It is skipping too much or not enough"
Why is flag / move to folder not showing up on my desktop mail client? Under Account Setup you can set the archive or flag command to move to a folder which you can specify. This will move it on your mail server and it will create the folder if not there. If you don't see the new folder or don't see the mail flagged in your desktop mail client, try logging into your mail account using the web version. If it is reflected correctly in your web version but not your desktop, make sure you are connecting to your server using IMAP and not POP. You need to use IMAP to see changes from another mail app. If it is not correct in your web version either, check your seever settings under Account Setup to make sure it is not set as POP on Speaking Email. If this does help, email us and we can review logs. How can I add voices on my iPhone? Speaking Email uses the Apple voices installed on your iPhone. You can easily download more enhanced quality voices. 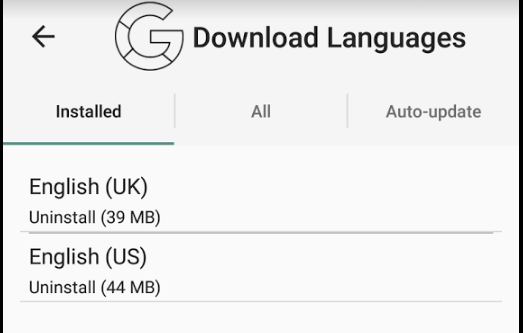 There you can download voices for any language. You need to be on wifi to download voices since they are quite big files. Back in Speaking Email you can now select those voices you've just downloaded. When you upgrade to Premium, you can choose any voice to be your email reader, and a second voice to be your "announcer". It is skipping too much or not enough - can I configure this? We detect and skip email signatures, disclaimers, phone number, web addresses and email addresses. You will hear "skipping signature" to let you know when this happens. Our detection is based on heuristics and is not always perfect, but is we think it is pretty damn good. We are continually improving it, and you are welcome to forward us any emails that are not being detected very well (eg a signature not being skipped or some text being skipped when it isn't a signature). Whether to read out the recipients, CCs, and time received. There is an option to cut off when a reply is detected - ie "reply skipping" - where you can choose whether to have it move on to the next email when it detects the start of a reply thread / email trail. Yes, of course! You can also customise this so it puts all mail archived by Speaking Email into a folder of your choice. By default it will create a new folder called “Speaking Email Archived” but you can change this to any folder you like or turn this feature off. You can change the options so that the "archive" command (or double-tap) doesn't move the email but instead just marks as read. This is the way many people manage their email (but we recommend archiving email to make your life less cluttered!). Note that this does not work on POP servers, so we recommend using IMAP if available. Can I check mail in other folders? Speaking Email is primarily an inbox helper. It reads out all emails in your inbox to give you an overview of what's current, and lets you archive emails to keep your inbox tidy. In future we may add this feature for other server types. Please email us if you would like this feature. Can I move to different folders? In a desktop context you may currently save each of your emails into an appropriate folder, for example one folder per client or project. To keep Speaking Email simple to operate, we don't support this. You must choose just one folder in Account Settings for your archive destination folder. We suggest customising the folder and call it for example "To File". You can then file the emails when you get to your desk. Does it to read emails automatically out as they arrive? Yes but only while Speaking Email is in the foreground playing emails. In other words, while you are listening to your inbox, any new emails are inserted in the next available slot, so when you move to the next email it will be one that has just come in. Note that while the app is in the background it will not start speaking. I can't hear any talking, what's wrong? Probably something simple! First, check your volume (press the + button to turn volume up). Then check the "silent" switch. If the phone is on silent mode it will not speak. If you hear the sender and time being spoken but not the email content (or the other way around), you may have a corrupted voice on your phone. Go to Preferences > Voices and choose a different voice. There are two voices you can select - the first one is the Announcer. Scroll down further until you see English Email Reader, and see what is selected. Then choose a different voice and see if that fixes it. How can I change the speaking language? Speaking Email uses your system language, so you can change this in your phone settings, under region and language. Does it use the mail settings in my phone? So therefore you have to look at your email settings, which you can find in your Settings in your phone or on your computer (eg in Outlook). First thing is what kind of email server is it? There are buttons to add the common types and "Other IMAP/POP" button if you don't know or it isn't listed. Once that is set up, to listen to your email you then just need to open the app. It will read the first 50 or 250 emails in your inbox, plus any that arrive while you are using the app. So you just open it when you get in the car, or when want it to start reading. This doesn't work for me - can I get a refund? Yes. If you are not happy with the app for any reason, we don't mind giving you a refund. For Apple users, go to https://reportaproblem.apple.com and login with your Apple ID. You will see a list of all apps you have bought and buttons to report a problem and request a refund. For Android users, if the purchase is within 2 hours, you can get a refund on the Play Store following this process. If it is after 2 hours, contact us on feedback@speaking.email and we will arrange a refund. Dictation does not seem to recognise when I say ‘period’ and it types it out. Why is this? When dictating a reply or forward message, you can speak the message and say punctuation to be included. Speaking Email provides dictation by using the operating system voice recognition APIs. It also depends on the language you are dictating in, which defaults to the language of the email you are replying to, and the locale of your device. For example if the email is English and you are in the US, you should be able to say "period" to get a dot - this is built into the voice recognition system on your device. If you are in the UK you can say "full stop" instead. In non-English languages you can say the appropriate word. If "period" is not working for you, instead try "full stop". As its more likely you might actually use the word 'period' in a message, we added "full stop" as a synonym that isn't dependent on operating system, language or locale. How do I ask "next" email by voice command? Just tap anywhere on the email to bring up command buttons, which should show "listening" as below. Then say "next". If it is not listening, tap listen button or change preferences to listen when buttons shown. There are also 2 other new options to listen for commands at start and end of email. Is there a shortcut to stop it talking? Yes! Just single tap anywhere on the email screen. Is there a unified inbox? If you have multiple accounts, a unified inbox would show all accounts combined into a single view. We don't support this feature, but it is on our development roadmap. Email us if you want this feature. As a workaround, you could create your own unified inbox by, for example, forwarding your accounts to a new gmail account that you create. You can even use gmail to check other IMAP and POP accounts directly, just look under Gmail Settings > Accounts > Check email from other accounts. Speaking Email is available on Android in the Play Store here, or search for Speaking Email. Does Speaking Email read out SMS text messages? Sorry, Speaking Email only reads out email. It does not read out SMS text messages. While this would be technically possible on Android, developers are not given access to intercept SMS messages on the Apple platform. We want to provide parity of features between iOS and Android as much as possible. We have been asked about supporting other message types, such as iMessage, WhatsApp, Viber and Facebook Messenger. These are proprietary formats and so are not likely to be accessible by third party developers such as ourselves. In any case, we believe it is sensible to stick to a core proposition, and it our case that is to focus on being the best possible talking email app available on any platform. Does this app read my email aloud? Yes! Speaking Email does just that. It reads your email aloud, so you can listen to email on the move on your iPhone or Android phone in the car or anywhere. It reads out loud all emails in your inbox, continuously, one by one, and new emails that arrive while you are listening are slotted in next. If you are so busy and get so much email you don't have time to read it during your working day, use Speaking Email to hear email read aloud to you. What TTS engine do you use for reading email? Speaking Email uses your phone's native TTS (Text-To-Speech) engine to read your emails to you in a clear voice. 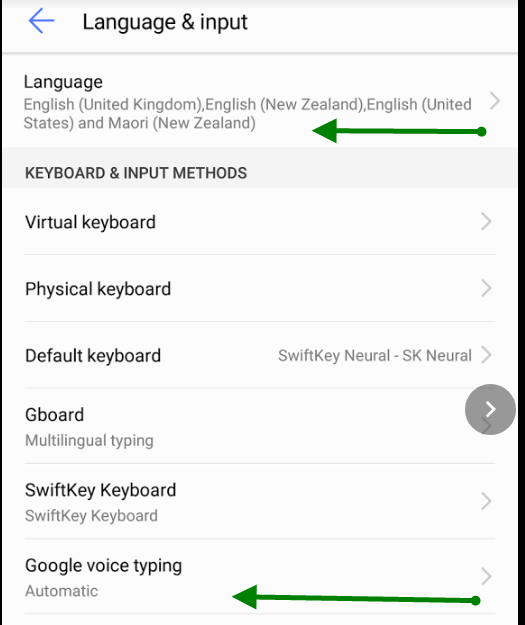 It uses your phone's regional settings so it speaks your emails aloud in your language and accent. We first extract the content from each email in your inbox, using our proprietary algorithms to turn emails into spoken language, and use the TTS engine to provide the speech synthesis of this email content. If you have the premium edition, there's a "multilingual" option too. This option switches voices based on language. It detects the language of the email contents and selects the highest quality voice installed on your phone of that language. 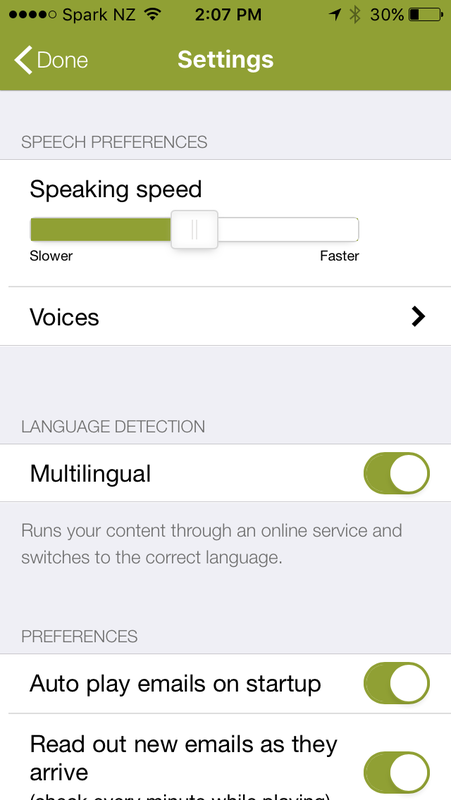 You can also select your preferred voice for your local language as well as English. Is there an app that reads emails? Yes - you are looking for Speaking Email. It's the app that reads your emails out loud to you. With the help of Speaking Email your phone can read your emails to you, with intelligent clutter detection to read out only the relevant email content. It also lets you reply and manage your mail with voice commands. Who is behind Speaking Email? Speaking Email is created and developed by Mike Nelson and Josh Cave at Beweb in New Zealand. Beweb is a locally owned web development company of 8 developers in Auckland, and have been using web technology to make business applications and websites for 15 years. See our website for more. What a great app! How can I help? If you really like Speaking Email we would love it if you could help us promote the app by telling people about it. "If anyone is looking for a voice email app, I'd recommend downloading Speaking Email - www.speaking.email"
We really appreciate all the positive support and recommendations we've had so far from users. Every one helps! I found a bug or I have a suggested feature, how can I contact you? We'd love to hear from you. Please send us an email on feedback@speaking.email, and we'll get in touch. Aren’t there other apps that can already do this? There are a few older apps which were not as full featured as Speaking Email but had some voice email features, and we believe are are no longer supported. If you had one of these, you might consider upgrading to Speaking Email. Speaking Email can reply as email text but Talkler replies by attaching an MP3. Speaking Email can play attachments (including attached MP3 files, PDFs and Word docs), but Talkler can't play attachments. ** Voice Dream Mail was new in 2015, and it provides a similar feature set to Speaking Email, but it has some shortcomings including no Exchange support, no email display and no signature detection. As with every other app here you will spend more time listening to email signatures and disclaimers than content. But don’t take our word for it, you should try Talker and Voice Dream Mail as well and see which you prefer. They all have free versions to try. Is this the best email app of 2019? Every year we wait and see, but again in 2019 it has not made it into any of the lists of the best email apps. While it's more a specialised email app, we still would like to be included in some of the magazine and review sites roundups of the best email apps of the year. 2019 looks to be an interesting year in the email client space, with several of the best email apps of 2018 now being defunct, including Newton, Google Inbox, and Astro (which also had voice commands like Speaking Email). What is the difference between Speaking Email and Out Loud app? There have been some good reviews of Out Loud, an Android app that reads your notifications out loud. Out Load speaks email notifications, but not the email content itself. Speaking Email is just for email and it lets you listen to the full contents of your email messages (while skipping disclaimers and signatures). It also continuously plays all emails in your inbox, making it a great tool to get up to speed on your latest emails hands free. Why choose Speaking Email over Talkler? Talkler and Speaking Email are priced about the same, and they both have free versions so you can try them both and see which you think is the best email app for listening to mail. They are both good apps but we (of course!) think Speaking Email is the best app in this category. Why choose Speaking Email over Voice Dream Mail? On the other hand, Voice Dream Email shows all mails in an inbox view, which you may want. Speaking Email doesn't have this (we minimise screens and navigation around the app to maintain driver safety). It is exciting to see the market starting to take shape, and we hope you will try this app as well as ours. Both Voice Dream Mail and Speaking Email have free versions and are priced about the same for the full versions, so try them both. I use AOLbyPhone but they are shutting it down, is this a replacement? AOL are discontinuing their AOLbyPhone service, which reads your email out loud to you via a phone service similar to voice mail. Speaking Email provides this service and is less than half the price of AOLbyPhone. We do not offer the ability to reply by taking a voice recording, which AOLbyPhone can do. But we do have several other features that AOLbyPhone lacked, such as attachment speaking, disclaimer and signature skipping, reply thread skipping. We have had AOL by Phone users switch over to Speaking Email and be very happy with the change. You can use your existing AOL account and easily compare the difference. I was using iLane, is this similar? iLane was a system for BlackBerry that allowed you to read and write emails by voice. This has now been discontinued, along with BlackBerry handsets. Speaking Email is a great replacement for iLane, if you have an Android or iPhone. It does not do all the stuff iLane used to do (such as voice dialing contacts, text messages, calendar, news, sports and weather) but it does read your email out loud much better than iLane. iLane also enabled reply by voice, which would send an audio attachment, which we don't support - but we do support customised single sentence canned replies. Do you use Microsoft Cortana, Siri, or Hey Google? No, we don't use any of these online services. We use the text-to-speech voice synthesis that is built into your phone. We use the default system voice. You can change your system voice in your phone settings. Does Speaking Email use Dragon Dictation? Speaking Email has voice command recognition and a dictation system which enables you to dictate a reply. We are not using Dragon Dictation for this purpose, but instead use the native technology provided by your device - from Apple or Google. Apple recently made available new technology that enables use of the native speech-to-text (speech recognition) system that Siri uses. This makes Speaking Email very good at recognising most accents. On Android we are using Google for voice recognition. This technology is somewhat variable on the different hardware platforms but has the advantage of working offline and requiring no thrid party installations.